COLUMBIA, Mo 4/19/17 (Beat Byte) -- Last year around this time, I was literally thanking God for Alex George. In a world awash with violent video games and insta-flix, the Columbia-based novelist dared step out with something novel these days: a festival of books, authors, reading and all things written word he aptly calls Unbound. Mr. George is back this year, with a new novel -- Setting Free the Kites -- and Unbound II, a day-long event that begins this Friday as An Evening with Sir Salman Rushdie, the closest thing civilization has to a patron saint of free speech. The good ol' boys of Iranian politics -- every political system has good ol' boys -- threatened Rushdie with execution, aka "fatwa", over his book The Satanic Verses, which they found offensive. But Rushdie has both resisted and lived, winning a host of important literary awards like the Booker Prize and British Knighthood. Mr. George and Unbound are offering Sir Salman's insights free of charge, and as expected, the Friday evening conversation sold out. The entire day Saturday brings loads more, however -- all free to attend, with gracious sponsors providing venues, funding, and dozens of authors and literary lights. 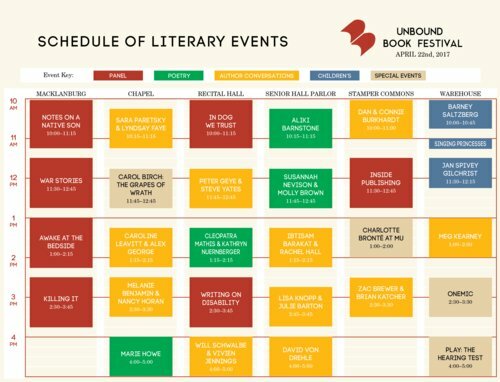 Unbound is basically a three-part fest: Events, Book Signings, and an all-day "Independent Author Fair." In different venues around the Stephens College campus, the event schedule includes panels, author conversations, poetry, childrens' books, and four "special events" at different times of the day. Poetry readings are scattered throughout the schedule, and include work by Aliki Barnstone, Missouri's Poet Laureate. Panels kick off with Mizzou English professor Alexandra Socarides hosting "Awake at the Bedside," about people who have written of their experiences providing care to the dying, a difficult subject that promises a wealth of insights. The "Killing It" panel features "five of the most talented and exciting women crime writers working today," including local authors Laura McHugh and Jill Orr; and Sara Paretsky, creator of famed fictional private investigator V.I. Warshawski, whom Kathleen Turner brought to the big screen. Four acclaimed writers – a memoirist, a military historian, a biographer, and a novelist – discuss writing about war. Experienced publishing pros discuss the ins and outs of the notoriously fickle publishing industry. The challenges and rewards of writing about dogs across a variety of genres. A discussion with four dynamic, prize-winning authors about writing on disability (developmental, neurological, anatomical, auditory) into novels, poetry, plays, and essays. A discussion of the African American literary and intellectual icon, whose acerbic, dead-on commentary about African Americans is more relevant than ever. One of the most successful crime writers of all time and one of the genre’s up-and-coming stars discuss their craft. Geye (Wintering) and Yates (The Legend of the Albino Farm) discuss – among many other things – the importance of place in their work. Two authors discuss immigrants and immigration in their work. Nostalgia, impetuous youth, and heartbreak as themes in recent literature, including their own. Young adult (YA) fiction, one of the most popular and exciting areas of publishing. Biographical fiction, and the complex balancing act of creating bestselling fiction out of real lives. Two memoirists discuss writing honestly and openly about mental health and other personal matters. The joys of reading: advice, reading recommendations, and a celebration of the glories of losing yourself in a wonderful book. Growing Up with the River: Nine Generations on the Missouri looks at the nine generations that have grown up in different communities along the longest river in America. Meg Kearney is the author of an acclaimed trilogy of YA novels-in-verse about adoption. Acclaimed author, journalist, and Editor-at-large for Time magazine, David Von Drehle looks at the velocity of change in communications technology and its disruptive impact on politics. Carol Birch performs her award-winning interpretation of John Steinbeck’s THE GRAPES OF WRATH. MU Libraries Special Collection: An original manuscript containing two short stories Charlotte Bronte wrote at the age of seventeen. Attendees will hear about the history of the manuscript, how it ended up in Missouri, and its relationship to Brontë’s other works. There will also be a rare opportunity to view the manuscript, which is smaller than an index card and written in an almost microscopic script. OneMic, based out of Columbia, MO, an open mic series fusing poetry of the page and poetry of the stage. Performance: “The Hearing Test”, a concert reading of Willy Conley’s gripping, award-winning one-act play about the misguided treatment of a young deaf man is produced and directed by David Crespy of MU’s Department of Theater. At the all-day Independent Author Fair, in Stephens College's Kimball Ballroom, you'll meet authors, learn about their books – many different genres will be represented – and buy them, too!